Repair of frequent dislocation of the shoulder. 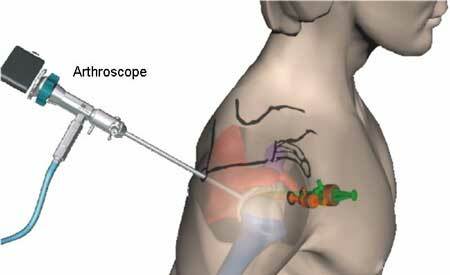 Two major shoulder positions are recommended for performing the arthroscopy. Beach chair position: The position corresponds to an inclined chair posture. Lateral decubitius position: The posture refers to the position where the patient lies on one of the sides in the operating table. The surgeons may choose either of the positions based the procedure performed. The arthroscopic process is similar to that performed in the knee. Once the diagnosis is established with the help of the shoulder images, many types instruments are placed through the same holes or new ones. These instruments does many functions like cutting, grasping, knot typing and suture passing etc. The incisions are mended with the help of steri-strips and they are covered by using soft bandages. After surgery, the patient will have to stay in the hospital for one or two hours. Recovery is much faster in the case of shoulder arthroscopy. The complete recovery may take few weeks from the day of surgery. For the first weeks, the patient may feel discomfort and pain. The doctor may prescribe some medicines for the recovery period. After recovery, the doctor may suggest some exercises. A regular exercises programme will help the body back to its orginal strength. If the patient had a more complicated surgery, the doctor may suggest to consult a therapist. There are only minute chances of risks and complications from shoulder arthroscopy. Studies say that, there are very less number of cases reported with negligible complications. However, risks are possible for any surgery. Those are minor and treatable. It may include infection, blood clots, damage to the nerves or blood vessels and excessive bleeding etc. Your surgeon will explain you the possible risks and complications before proceeding the surgery.